Our hands have a lot to say about us. They are created while we’re still in the womb; the fingers sprout and lengthen in response to the chemicals in our mother’s body, shaping who we will be when we emerge. 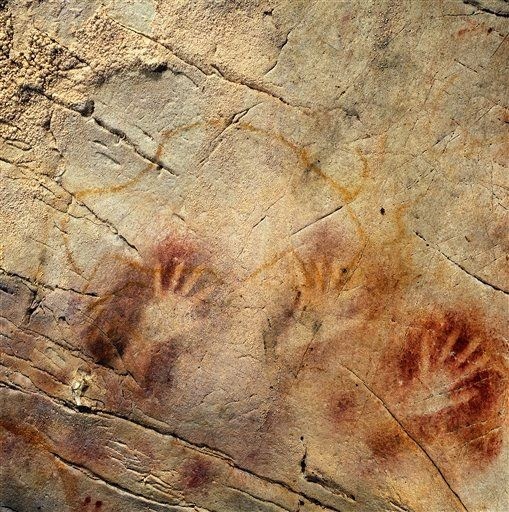 Scientists now think that the ancient cave painters were women based on the hands that were painted on the walls. Traditionally, the artists were thought to be men since the scenes depicted were those of animals and hunting–“male” pursuits. But one archeologist at Penn State started looking at the length of the fingers. It is known that testosterone has a direct impact on the length of fingers in an unborn child. The surge of testosterone in the 2nd trimester makes a boy’s ring finger longer than his index finger. In contrast, without that testosterone surge, a girl’s hand has an index finger and ring finger that are similar in length. The hands pressed to the cave wall while paint and dye was painstakingly used to outline them, leaving forever a signature that says, these are my pictures, I drew them–these hands have ring fingers and index fingers that match in length. So what does that mean? Does it mean that women were the hunters while men were the gatherers in ancient society? Does it mean hunting and gathering was not segregated as men’s or women’s work, but all strived to ensure the survival of all? Does it mean that women were the historians who felt the need to record daily activities important for survival? Does it mean that women were the spiritual leaders, the ones putting the hopes and dreams for a successful hunt, communing with the animal spirit through pigment and dye? For me personally, I think the question of gender is fraught when we try to extrapolate from images of the past, unable to see the whole picture, only one interpretation of it. To me, the cave paintings say that art has always been with us, with women and men, harrying us, chasing us, bursting from our chests, trembling from our fingers, aching to be expressed.